Even though I live in the Detroit area, my heart beats fast for the East Coast. 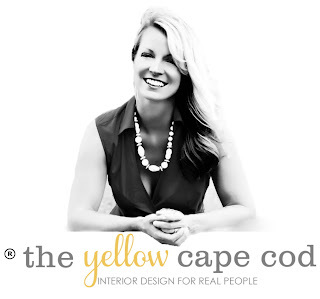 You can imagine my excitement when I landed the opportunity to design a family room in a Cape Cod vacation home for some very special clients through my Online Design Service (Please click here for more details on this service). This house is currently used as a family getaway, but will eventually become a full time residence when my clients retire in a few years. Our goal was to give them a gorgeous, character rich design that embraces a crowd of guests and in time will also provide the comforts of a full time home. (A complete source list is at the bottom of this post). 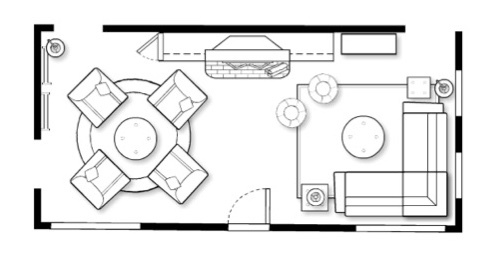 We took a long, narrow space and divided it into two zones; a "Lounge Zone" and a "Sofa Zone". The Lounge Zone is made up of a reclaimed wood coffee table surrounded by four comfortable swivel base arm chairs. The Sofa Zone features a large sectional sofa, a pair of floor poufs, another reclaimed coffee table, two character rich side tables and a unique bookcase. A flat screen TV was placed over the fireplace so that it can be seen from both zones. We suggested a fireplace makeover that includes a custom door feature that would reveal and conceal the TV as needed. These custom doors would be a gorgeous design element that allow the fireplace to be a stunning focal point while placing the TV in a great viewing location. The chairs we selected for the Lounge Zone feature navy blue twill fabric slipcovers that can be removed and laundered as needed. The large, round, natural fiber rug we selected is the perfect complement to the dark color of the chairs. Crisp, white, accent pillows provide stunning contrast that keeps the overall look light and bright. This area will be great for intimate family conversations, game nights, movie nights, quiet lounging or reading next to the fire. The table we chose features a parquet top made with reclaimed wood. The detail on the table top provides character and rustic charm. 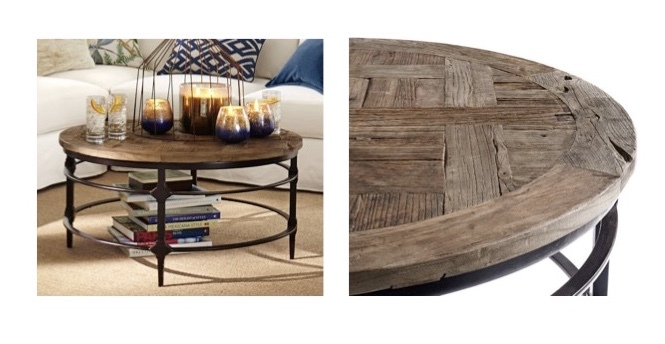 The round shape makes this table a great choice for tight spaces. To create a sense of symmetry and balance in this two-zone-space, we repeated the same round coffee table in the sofa zone as in the lounge zone. 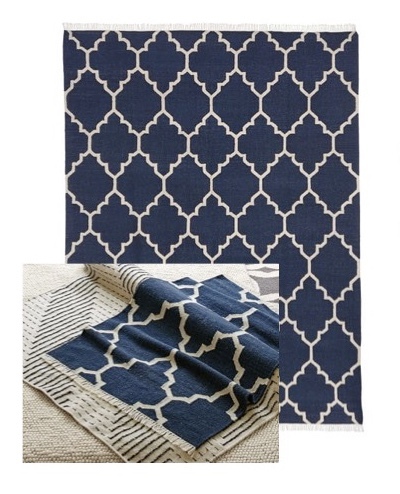 To provide pattern, color, and softness to the sofa area we selected a large navy blue and white trellis patterned area rug. You can see in the image below how this rug has a nice flat weave and low pile that gives it a relaxed, casual look. The sofa we recommended is a white twill slip covered sectional. This white sofa looks amazing on top of the dark navy blue rug. A slip covered sofa is a great option for a family vacation home, the slipcovers can be removed and laundered as needed. The bright white upholstery keeps the space looking bright, airy and fresh. 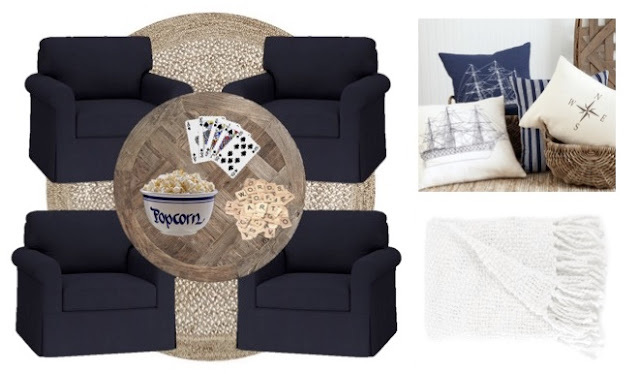 We created a custom mix of toss pillows and throws for the sofa. 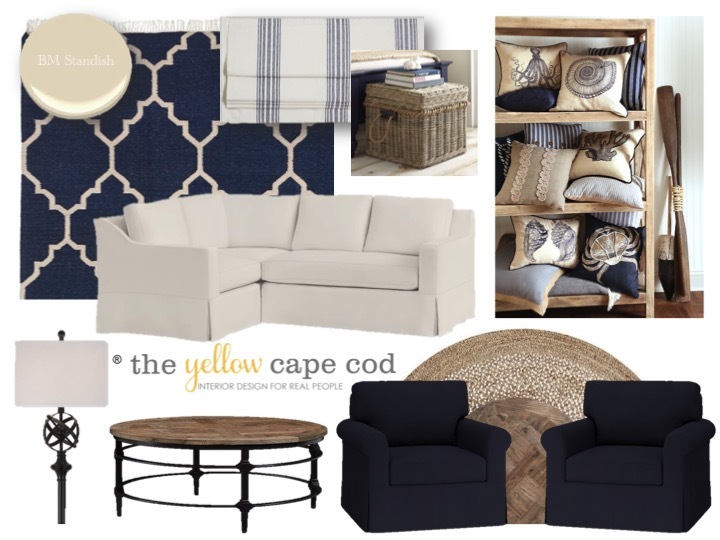 Navy, tan, and gray pillows will pop against the white sofa. 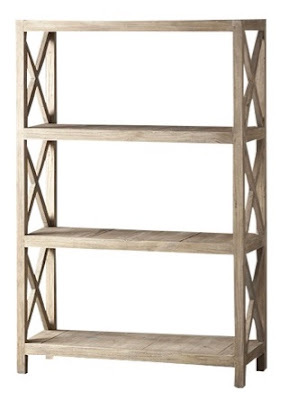 In the empty corner to the right of the fireplace, we placed a beautiful, raw wood bookcase. This will be the perfect place to house the TV components while also providing attractive display space for my clients collectibles. 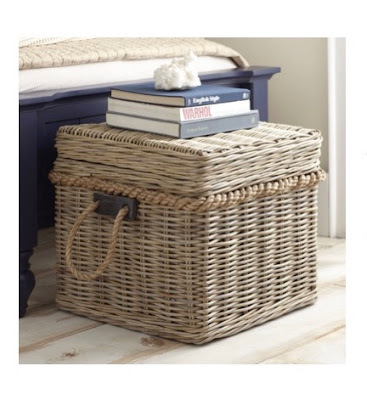 A large storage basket with a wire construction was placed at the end of the sofa for storage as well as a make shift end table. For the windows, we kept the look casual with simple, fabric roman shades. Roman shades hung on an outside mount just above the top of the window will make the windows in this room look taller than they actually are. They also add softness and privacy without blocking natural sunlight and the view to the outside like full length drapery could do. 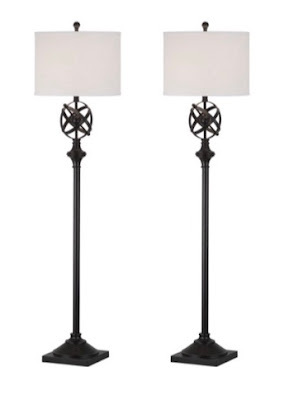 For task lighting, we incorporated a pair of floor lamps with a ton of personality. In front of the fireplace we placed a pair of floor poufs. These are a very cute design element, but more importantly they provide extra seating for youngsters around the coffee table. 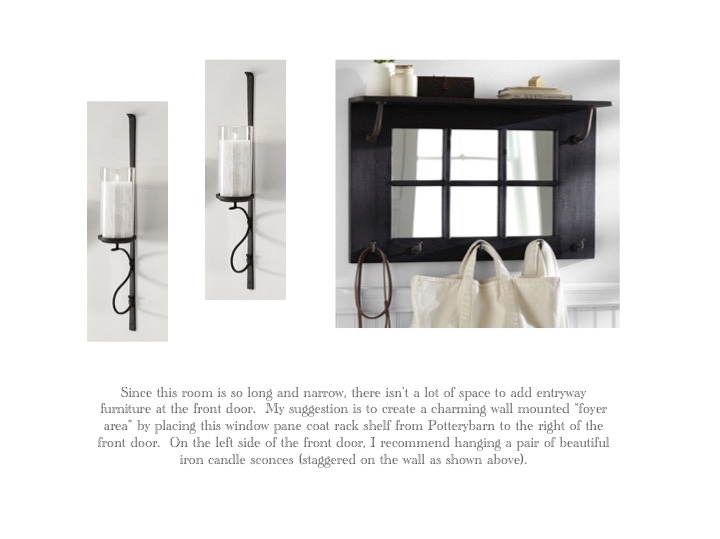 These are just some of the recommendations we made for this cape cod vacation home project. 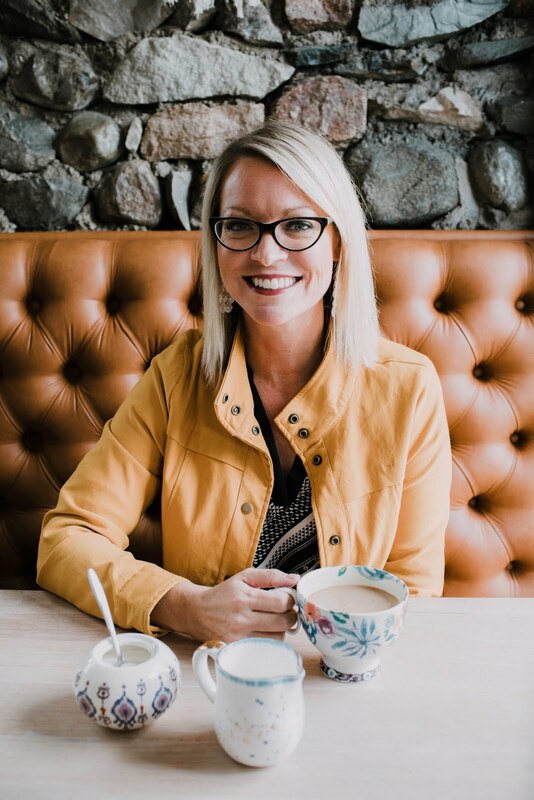 As with all of our online design plans, we provided suggestions for everything our clients need to create a complete, professional looking design in their home along with tips and tricks on implementing their design. 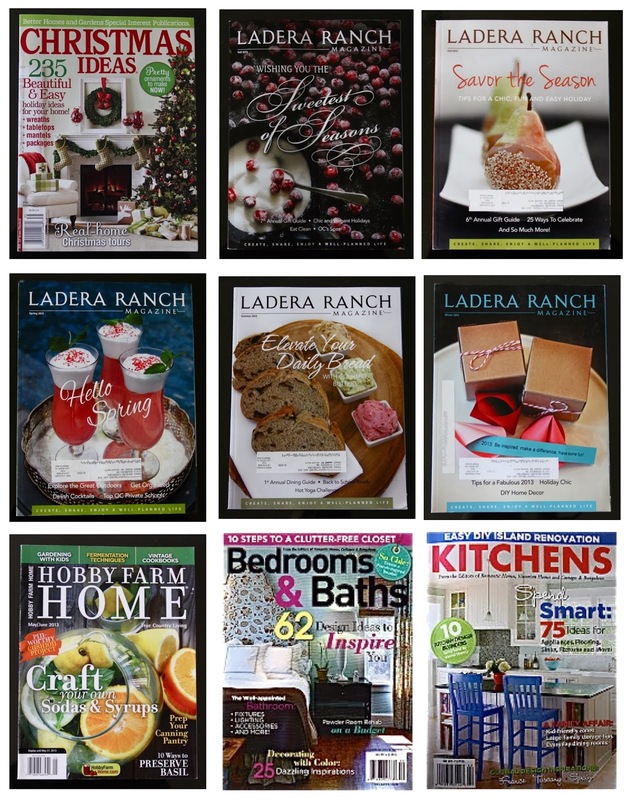 We currently have openings for new online design projects, however the spring time typically fills up fast. 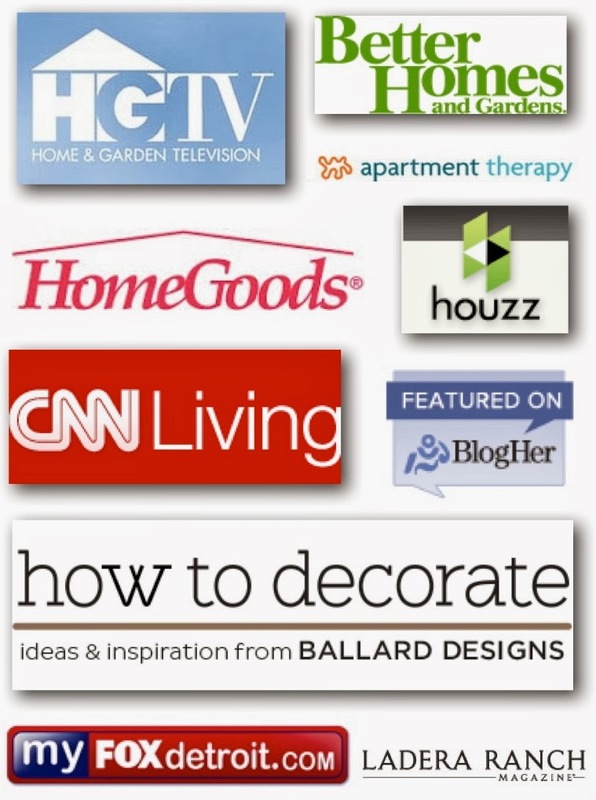 If you are interested in a custom design for your home, now is the time to reserve your e-design! I love this!! I like you even more now that you love the East coast too. I just said via IG in an updated into that although I live in Michigan, my heart belong in Maine OR somewhere on the coast! 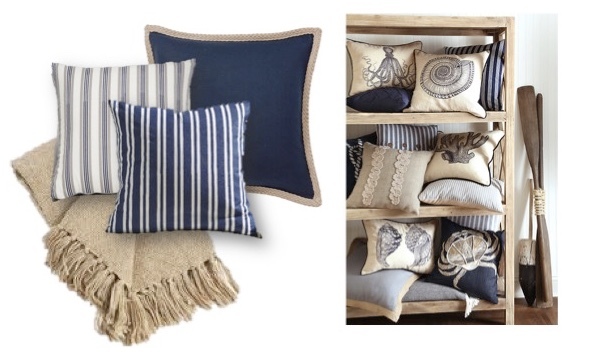 I love the pillows & the bold navy! Happy Wednesday!